Notes: Pat's Rubberlegs is also known as Jimmy Legs, Knotty Girls, Restless Stone, The Turd, and The Pickle. "Pat" has been suggested to be a guide, Pat Bennett, that works out of the Hyde shop in Island Park, Idaho but this may be a ruse. 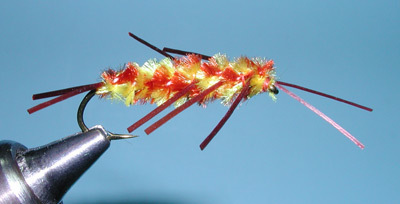 Jimmy Legs is a variation from Idylwild Flies in which the legs are pre-knotted and tied on a bent hook, such as a Daiichi 1730. Knotty Girls also have knotted legs but they are usually round rubber material. Restless Stone is another name as marketed by Umpqua. 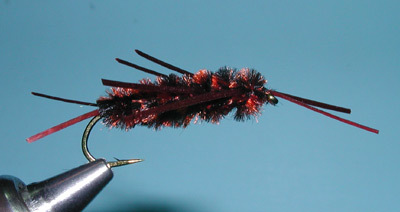 Whatever the name, the pattern works quite well and has become a favorite among guides. 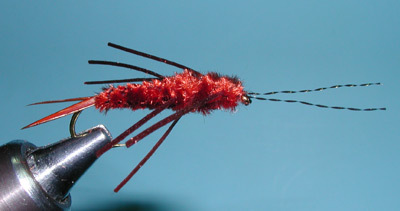 The pattern is a variation off an older pattern known as the Girdle Bug. This pattern was developed in the 1930's by Frank McGinnis of Anaconda, MT. He developed this pattern while fishing the Big Hole River. Originally, round rubberlegs was used but a spandex rubber material such as Super Floss, Flex Floss, Life Flex, and Spanflex has become preferred over round rubberlegs. It is much more durable and transparent than rubberleg material and very supple with lifelike movement in the water. 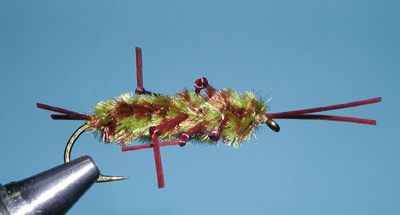 Mickey Wooton, a guide out of West Yellowstone, came up with a nice variation of trimming the chenille at the abdomen for a flattened taper and replaced the antennae and tails with Krystalflash and Goose Biots, respectively. Fish Pat's Rubberlegs in the riffles and runs of fast moving water. 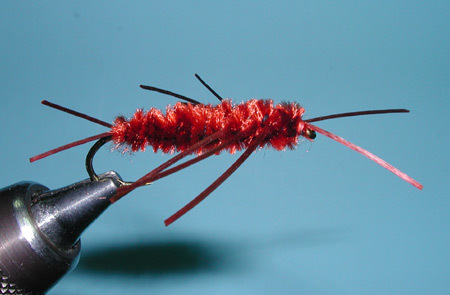 It also makes a great pattern for short line nymphing. The weight of the pattern allows it to quickly sink into deeps slots and pools. Great with a Beadhead dropper such as a Prince Nymph or Hare's Ear.